Stars: Michael Caton, Mark Coles Smith, Emma Hamilton, Jacki Weaver, Ningali Lawford-Wolf, David Field, John Howard. 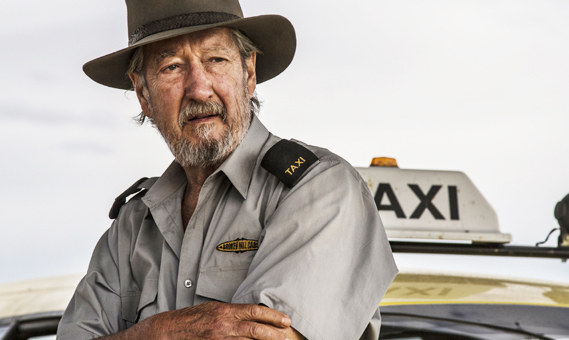 Based on a true story, Last Cab To Darwin is a rich and beautifully written character study that tells the story of Rex Macrae (Michael Caton), a taxi driver from Broken Hill diagnosed with terminal stomach cancer, who drives all the way to Darwin to try and take advantage of the new euthanasia laws being enacted in the Northern Territory. Actor turned director Jeremy Sims (Beneath Hill 60, etc) and his regular collaborator playwright Reg Cribb (Last Train To Freo) came across the story and thought it was a beautiful allegory about a man driving to his death and learning the importance of life and friendship during the journey. They first wrote Last Cab To Darwin as a stage play, and they have beautifully opened up the material for this film version. It becomes another variation on the classic road movie, but gives a rather unique Australian flavour to the tropes of the genre with generous touches of larrikin humour and some gorgeous scenery. Last Cab To Darwin deals with a couple of important issues, including the controversial and deeply personal issue of euthanasia, and the state of race relations in contemporary Australia. But Sims and Cribb wanted to avoid becoming too preachy on the subject, and the film is leavened with generous touches of humour and warmth. And the script gets under the skin of its central character. Integral to the success of the film is the performance of Caton, best known to audiences as the lovable larrikin Daryl Kerrigan from the classic The Castle, but his work also includes roles in beloved television series such as The Sullivans and Packed To The Rafters. Caton’s superb and nuanced performance here as a lonely and cynical man facing his own death demonstrates another side of his talents and ranks as some of his best work. He is an endearing and likeable character despite his flaws. Mark Coles Smith (Airlock, Pawno, etc) brings an irrepressible sense of energy and mischief to his performance as Tilly, a young aboriginal footballer Rex picks up along the way and he gives the material the jolt of energy it needed. And Emma Hamilton is also good as Julie, a British nurse backpacking her way around Australia, and she brings a touch of compassion and warmth to her performance. Ningali Lawford-Wolf also resonates strongly and brings an emotional quality to her performance as Polly, the feisty aboriginal woman who lives across the street from Rex. Her sparring patter hides her real affection for the curmudgeonly loner. Jacki Weaver plays the small role of Dr Farmer, who is keen to introduce euthanasia; she shows the tough side of a character whose obsession may have meant that she has forgotten her calling and her sense of compassion. Reg’s friends back home in Broken Hill are played by veterans like David Field and John Howard (from Sea Change, etc). And there is a nice cameo from football legend Brian Taylor as a football coach. Sims and his crew shot the film in Broken Hill, which has provided the evocative backdrop for a number of classic Australian films, from Wake In Fright to Mad Max and Priscilla Queen Of The Desert. The town itself serves as something of a metaphor for Rex, who has a big wound inside of him that needs to be healed. The outback is very much a character in the film during the 2000 km journey. Last Cab To Darwin has been beautifully shot by cinematographer Steve Arnold, who has given it a burnished look reminiscent of some of the classic auteur films from the 70s. Ed Kuepper’s score is also evocative. Last Cab To Darwin is an enjoyable, affecting and life affirming film that is one of the best local offerings to hit screens so far this year.